This record was made under the guidance of Representing NYC, a volunteer network of artists interested in youth development in Bushwick, Brooklyn. Their mission is to bring the inspired Hip Hop related art work being done in the context of social services to bigger audiences through collaborations with professional artists from Brooklyn's underground music scene. Nine 11 Thesaurus are the most recent group of politically engaged MCs to emerge from East Brooklyn. Anywhere from 5 to 9 strong, these young MCs evoke early Wu Tang Clan concerts with their raw energy and masterful rhyme writing. Nine 11 Thesaurus are named after the tragedy of September 11th 2001, when some of the MCs lost family members, thus spawning their oft recited tag "when the towers fell we rose". After years of writing rhymes, spitting, free-styling and battling, the current, and lasting line up of Shasty (Maurice Douglas), God'sun (Kevin Matos), P-dot (Frederic Aldeco), Riddic.C (Barrington Botswana Black), and Hollywood (Kaymel Matos), met and got organized at the Beacon Center for Arts and Leadership in Bushwick Brooklyn. 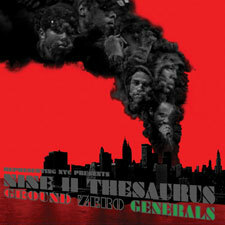 It was there that the young MCs linked with Representing NYC founder (and member of Brooklyn band Zs) Sam Hillmer, beginning conversations, meetings, and later rehearsals, performances, and recording sessions, that would lead to the release of Ground Zero Generals. Ground Zero Generals evolved during the 2008/09 academic year, and was perfected and recorded in 2010. It is Nine 11 Thesaurus' first studio recorded and professionally released album, (though they have a couple of mix tapes on the streets), and is also the 2nd installment of Representing NYC's recording series following The Fly Girlz' 'Da Bratz From Da Ville' release from 2009. As with all Representing NYC releases, the album features an unlikely pairing between MCs and producers, this time featuring production by Tim Dewit (Gang Gang Dance), and Matt Mehlan (Skeletons). Ground Zero Generals abandons the soulful break beat, the musical vehicle of choice for most revolutionary Hip Hop artists, in favor of something more grim, more cutting, but also more creative, evoking the aesthetic of Grime and Dubstep, and the content of Gil Scott Heron. From the introductory opening track onward, Nine 11 Thesaurus explore oft forgotten or overlooked dimensions of life in the streets of Brooklyn for young people – whether through illusion to the Black Panthers, discussions surrounding the ways in which the legacy of slavery lives on in the minds of their piers and the behavior of Police officers, or through abstract phantasmagoria of words and images presented in rhyme, they remain committed to excavating the unseen aspects of their experience as young urban people coming up in post September 11th New York City. Their findings are presented with incendiary precision, over futuristic sound collage of the highest order, on this compelling debut album. Over the past few years Nine 11 Thesaurus have shared bills with Mr. Lif, Rahiem of Faby Five Freddy and the Furious Five, Prefuse 73, Kevy Kev of the Fantastic Five, Dutty Artz, Ninjasonik, Janka Nabay, Das Racist, Sian Alice Group and The Magik Markers. The 5 MCs of Nine 11 have also sparked a long lasting collaboration with seminal Hip Hop film- maker Charlie Ahearn (Wild Style) who has directed a series of shorts about the group.